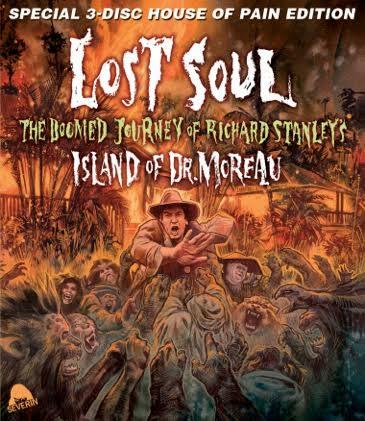 The acclaimed Severin Films original production LOST SOUL – THE DOOMED JOURNEY OF RICHARD STANLEY’S ISLAND OF DR. MOREAU will make its Blu-ray and DVD debut on July 14th. Discs will contain over an hour of out-takes, additional interviews with John Frankenheimer and Barbara Steele, concept art gallery with Stanley commentary, Boar Man Diary featurette, location featurette and more. The Special ‘House Of Pain’ Edition will also contain a DVD of the long thought lost 1921 German version of Moreau THE ISLAND OF THE LOST with English subtitles, plus more interview featurettes. A third disc will contain a brand new audiobook recording of H.G. Wells’ ‘The Island of Dr. Moreau’ read by Richard Stanley. In 1995, visionary writer/director Richard Stanley (HARDWARE, DUST DEVIL) got the green light for his dream project: An epic adaptation of H.G. Wells’ ‘The Island Of Doctor Moreau’ starring Marlon Brando and Val Kilmer. 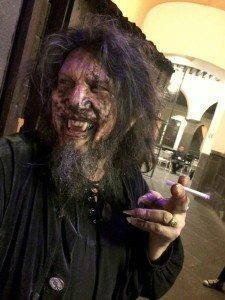 But only days into production, an unprecedented storm of natural disasters, monstrous egos and disturbing imagery – along with chaos, insanity and witchcraft – would trigger perhaps the most infamous behind-the-scenes catastrophe in modern movie history. Now director/producer David Gregory (THE THEATRE BIZARRE, PLAGUE TOWN) reveals the untold story behind “one of the all-time greatest cinematic train wrecks” (Variety) in this “wonderfully weird and gripping” (Entertainment Weekly) documentary featuring never-before-seen footage, startling new interviews with actors Fairuza Balk, Marco Hofschneider and Rob Morrow, studio executives, crew members and Stanley himself. In regards to your new release, Lost Sou, is the Island of the Lost (1921 German film) extra only on the Blu-Ray edition or is this on a regular dvd with only the documentary itself on Blu-Ray. Thanks for your assistance with this. Paul, the 1921 film is one of the discs on the 3-disc House of Pain Blu-ray edition and only on that edition. Hope this helps and thanks for asking. I don’t know much about rights with footage and such, but seems like there was missed potential for a comment on the perception of val’s behavior itself. i need to know more about why and when things turned sour between him and richard. in 1996 listen to what he tells david letterman (on national tv) about getting Richard fired: https://youtu.be/jaerdjBKqoE?t=235. also, listen to what oliver stone, angelina jolie, david mamet and others say about working with him: https://youtu.be/9rjZNK2TpcU?t=157. I’d love to hear Dave Gregory’s thoughts on this. Great film by the way! What region coding are the DVD and Blu-Ray, and is the documentary on both? Hi, They are all region and the doc is on both. Thanks!